Our final day aboard the Tahitian Princess arrived. We had a marvelous time these past 10 days in Polynesia / Cook Islands. The sun was shining, casting shadows on our balcony as we looked out at Papeete once again. Although our cruise was now officially over, unlike other cruises, disembarkation would not occur until later in the afternoon. One of the best things about the disembarkation process in Papeete is the ability to checkin for your afteroon / evening flights either on the pier, or as was the case for us, at the airport. After breakfast, we disembarked the ship, claimed our luggage, and boarded a shuttle bus for Papeete airport. Recall that we were booked on an Omni Air charter. We checked our luggage in, obtained our boarding passes and returned to the Tahitian Princess to enjoy our final day in Tahiti. Depending on the airline, some passengers were able to checkin at the pier, while the others were taken back and forth to the aiport to checkin. Either way, when it was time for your flight later in the day, you wouldn't have to worry about your luggage, which was fabulous. 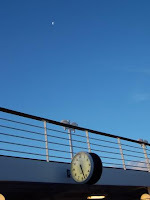 In the morning, we had the ship to ourselves, but later in the day, passengers for the next week began to arrive. Since we were in port, the shops and casino were closed of course, but you could still purchase your photos if you didn't do so already. Any purchases would have to be with cash since our onboard accounts were already closed out. TIP!! When we embarked the Tahitian Princess, they were selling "Coke stickers" which came with a reusable Coke container. The sticker allows you to get unlimited fountain drinks throughout the cruise, including disembarkation day. We could simply bring our Coke container to the bar to get a refill. Normally, we wouldn't purchase a "Coke card" on a ship, but on this cruise, it made sense (especially since you could use it on the final day without having to worry about cash). 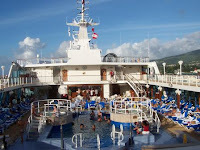 Tahitian Princess - Final Day (Papeete) photo album for the conclusion of the cruise. Note that in this picture the moon is rising and the clock is about to strike 5:30 PM. It was now time to say goodbye to the Tahitian Princess and head to the airport, this time to actually depart for home. Expect to find slow moving, long lines at the airport. The passport control line takes some time to get through, but Princess allowed sufficient time and we had no problems catching our flight. Tahitian Princess was a wonderful ship for this cruise due to it's size and the small number of passengers. If you decide to book Tahiti on this ship, plan early so that you can get your choice of cabins (or any cabin for that matter). Tahitian Princess is being redeployed to Alaska this year before it returns to Tahiti for the fall. She will be doing a 108 night World Cruise in January 2009. I hope that you have enjoyed our visit to Tahiti. If you haven't already done so, check out our Cruise Vacations website and additional photos. Contact me if I can help plan your Tahitian vacation. 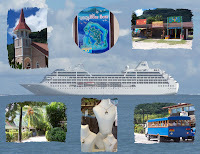 I hope you have been enjoying our Tahitian Princess - 10 Day Polynesia/Cook Islands cruise. Our next port of call was Moorea in French Polynesia. This island is the "sister island of Tahiti". It's hard to believe but this was our last port of call before returning to our starting port of Papeete. We arrived in Moorea around 8 am and sailed around 5 pm. This gave us a full day to see the sights of Moorea. After breakfast, we took a tender to the pier and did some shopping in the tents that were setup near the tender dock. We could have hired a local driver to take us to a shopping area, but we really didn't need to do that. If you haven't booked an organized tour, there are several vendors to help you dockside. 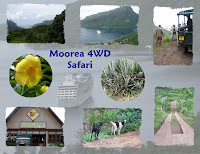 Our final shore excursion, Moorea 4wd Safari, went from from 12:45 pm to 4:15 pm. We boarded our 4WD vehicle and drove through the Paopao Valley, passing pineapple plantations. Our driver stopped our vehicle a few times so that we could take pictures of the pineapples growing alongside the trail. The tour continued across the Paopao Opunohu trail to Le Belvedere Lookout for views of Cook's (or Paopao) and Opunohu Bays. It was an overcast day, but the scenery from the lookout was still pretty amazing. We looked down and saw our ship comfortably resting in the bay, waiting for us to return. Our guide then drove us to the top of Magic Mountain where we hiked the last 300 feet to its summit for a stunning view of Moorea's north shore. It was so lovely up there, we hated to climb back down to our vehicle, but we still had one more stop to make before returning to the ship. The final stop was at the Jus De Fruits De Moorea (Fruit Juice Factory of Moorea) where we sampled the various fruit drinks and had some time to purchase souvenirs. Keep in mind that this trip was before the 3-1-1 days of air traveling, so we didn't have to contend with those limitations. I believe they will also ship to any destination, so that would probably be the way to go these days. As usual, we've posted some Moorea 4WD Safari pictures on Kodak Gallery for you to enjoy. If you want to explore on your own, the following guide will give you some ideas of what to do around Moorea. Now that our tour was over, it was time to pack our suitcases and get ready to disembark the ship for our flight home. In my final post on this cruise, I'll tell you how our final day in Papette went. Disembarkation day on this cruise is quite different than on other cruises, so you'll defiinitely want to read about our final day aboard the Tahitian Princess. 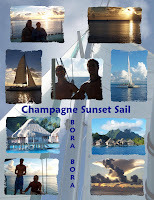 Our next port of call was Bora Bora in French Polynesia. This island in the middle of a beautiful lagoon is known as "the Pearl of Polynesia". I'm sure you'll agree this was one of the highlights of the cruise. Before clicking on the picture to the left (to get an enlarged image) close your eyes and try to picture the beautiful waters and majestic mountains that took our breath away as the Tahitian Princess sailed into Bora Bora mid-day. The waters were every shade of blue and green imaginable including emerald, turquoise, powder blue, dark blue, and sky blue. The green vegetation, thatched huts, and billowy white clouds completed the canvas that was unfolding before our eyes as the ship arrived at our destination. After the ship dropped anchor, we took a tender ashore. We decided to just walk around the village for awhile. Our little walk took us past an old church, quiet streets, and a few local shops. We purchased a few items from the local market and returned to the ship to get ready for our evening excursion - a champagne sail. which started at 4:30 and ended at 7:30 PM. There were two catamarans that took our group on the sunset sail. The weather was beautiful. The crystal blue sky was decorated with the same billowing clouds that had been in the sky all day long. We knew we were in for a treat when the sun would begin to set. Timing the shot perfectly, the second catamaran was backlit by the setting sun, casting it's shadow onto the water between the two sail boats. We were able to get many more photos before the sun completely set and it was time to return to our ship. The catamaran served as our private tender boat that night, depositing us back where we had begun this fantastic evening. Our first day in Bora Bora was almost over, but we were not done exploring Bora Bora. In the morning, we continued with two shore excursions . 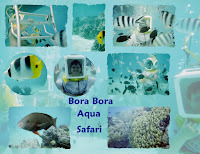 From 8:30 am to 10:30 am, we donned yellow helmets for the Bora Bora Aqua Safari. 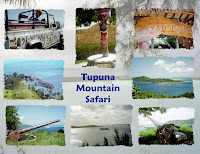 We then took the Tupuna Mountain Safari And Island Tour from 1:00 pm to 4:00 pm. We have enjoyed 4WD excursions on other cruises, so that's why we decided to book this tour. One of our favorite things to do on a cruise is explore under the water. When reviewing the various shore excursions for this cruise, we decided to get a little more adventurous than we had in the past. The Aqua Safari sounded amazing and it truly exceeded our expectations. I should tell you that this was my idea and I'm not a good swimmer. My husband thought I'd lost my marbles when I suggested it, but he went along with the idea and he is extremely glad he did. We sailed from our ship to a diving platform where we were greeted by the rest of our excursion crew. After a brief safety instruction, we donned yellow helmets that were hooked up to an air supply. The helmets weighed about 75 pounds, but you would not know it because in the salt water, it didn't feel heavy at all. You can keep your glasses on (which was great for both of us). We walked down the ladder and were emersed in 10 feet of water surrounded by schools of tropical fish that came to greet us. Armed with our individual supply of bread, we were able to keep the fish coming right up to us as we walked along the bottom of the lagoon. Don't worry, we were not alone down there. An experienced scuba diver was keeping a watchful eye on us the whole time. The only time my husband was scared was when they had to switch air tanks. For a brief moment, he didn't hear the comforting sound of air rushing into his helmet, but all was well. This was the most amazing experience we've had in the more than 20 years of cruising. 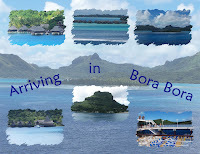 We both highly recommend this tour - especially in the crystal clear waters of Bora Bora. Our day in Bora Bora concluded with a 4WD safari which took us to the top of Tupuna Mountain where we got a view of the entire lagoon, our ship, and were able to see the sights of the WWII guns of Bora Bora. We ended our tour at Bloody Mary's which is probably the most famous tourist spot on the island. I hope you have enjoyed your visit to Bora Bora with me. Make sure you visit our photo albums for more pictures. Words just don't do justice to this "Pearl of Polynesia". 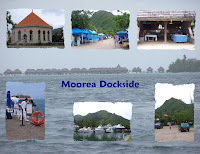 Next time we visit our last port of call, Moorea, before returning to our disembarkation port of Papette. Tahitian Princess arrived in Raiatea, French Polynesia 6:00 AM in the morning. 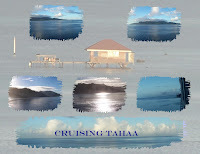 It would remain there until 6:00 AM the following morning giving us plenty of time to explore Raiatea and Tahaa. Raiatea is known as the "Sacred Island" and Tahaa, the "Vanilla Island". but for us, this was Black Pearl country. After breakfast it was off on our shore excursion, Tahaa Pearl Farm Visit And Motu Mahaea Beach, which went from 8:30 am - 12:00 pm. We were able to visit a Black Pearl Farm and then spend some free time on Motu Mahaea. Since we didn't have time to shop for black pearls in Papette, this was our next choice. We arrived at the Motu Pearl Farm where we were greeted by a guitar player and several Polynesian singers. The owner's daughter provided a short talk about black pearls explaining the entire process and allowing us to get our first look at black pearls close up. 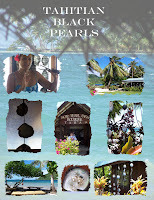 Just like most other precious gems, the color and quality is very important, so if you go shopping for a black pearl in Tahiti, make sure you get the quality that matches your budget. It is best to purchase the loose gems and have them set back home. After our Pearl Farm tour, we returned to the ship to relax before our evening entertainment. 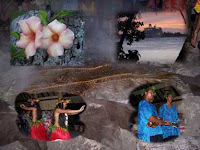 No visit to Polynesia is complete without a Motu Ofetaro Feast & Traditional Polynesian Show. We booked this dinner show, which went from 5:00 pm - 8:00 pm. When we arrived at the motu we were greeted with a traditional flower welcome by a Polynesian woman in traditional dress. Preparation was underway for the entertainment and dinner. We had time to explore the motu before the buffet dinner. The main entree was a pig which was being prepared in a pit. The sun was starting to set. We could see our ship glowing in the sunset in the distance. The dinner was excellent and the entertainment was fantastic. There were even a group of Polynesian children that performed for us. Part of the show was perfomed outside prior to dinner, and the conclusion were Polynesian dancers performing as we finnished our meal indoors. Note: I recently checked to see if Princess Cruises still offered this excursion, and noticed that it was not listed. I hope that the dinner show is still being performed because it was a very enjoyable evening. You might want to research alternative evening entertainment if this tour is not available on your cruise. The next morning it was time to say an early good-bye to Raiatea and Tahaa. The Tahitian Princess set sail past Tahaa towards Bora Bora as the sun was rising, making for some incredible sunrise pictures. Check out the following photo albums for more pictures of these two ports of call. Next time, we arrive in Bora Bora to continue our Tahitian adventure. Our next port of call was Rarotonga in the Cook Islands. How does viewing tropical fish from the comfort of a glass bottom boat, followed by snorkeling and a picnic sound to you? If it sounds good, Captain Tama's Lagoon Cruizes may be your ticket. We booked the Muri Lagoon Cruise & Lunch shore excursion which went from 12:00 - 4:00 pm. It included a cruise aboard a glassbottom boat and a barbecue lunch on a Motu. It is possible to book directly with Captain Tama's if they have availability. In our case, Princess Cruises had booked all the available space on this tour. The day was overcast, so the snorkeling wasn't very good. The lunch made up for it, however. We had grilled swordfish, fried bananas, potato salad, cole slaw, bread, and fresh fruits. For more pictures, click here. Despite the overcast skies, we still had a wonderful day in paradise. 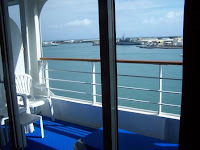 Tahitian Princess had a day at sea before we arrived in our next port, Raiatea which I will describe in my next post.